This week its the 2016 British National championships at Ponds Forge in Sheffield. With the prospect of a great weeks swimming lined up, catch up with the Team Salford events day by day. 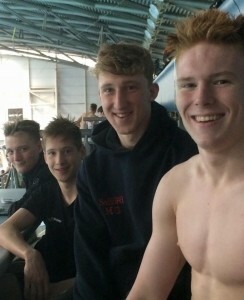 There was a steady start to the meet this morning with the 400 lads (Marcus, Scott and Matt) swimming just outside their PBs – Scott & Matt moving into the finals later. 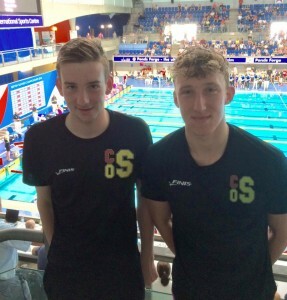 Elsewhere Marcus and Will gained PBs finishing 23rd and 21st respectively in the 15 years 50 Back. 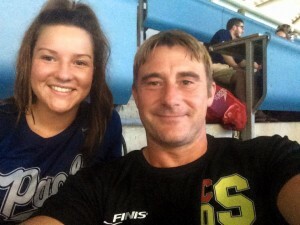 Katie McCarthy finished 13th in the 400 IM and 50 Breaststroke while Chelsea Crabtree (swimming at her first British Nationals) just missed the final by 0.07 in the 15 years 50 Breaststroke. In the 400 freestyle finals Matt George (16) arose from the morning slumber to reduce his heat time by 7 seconds in finishing 5th with a huge PB of 4:02:50. Scott Provan has had a tough time with illness in the run up to Nationals but he put in a great performance to finish 8th in 4:12:47. We said farewell to Jaeger Turner who popped in to cheer on Salford before boarding the big bird back to the USA – Good Journey JT ?? Roll on Day 2 …. More PBs Please …. Great start to day two with Emma Jones starting the proceedings with a 100 Backstroke PB. Elly Fraser (13) and Chelsea Crabtree (15) followed this by heading into tonight’s finals in the 200 Breaststroke. Katie McCarthy had a strong swim but just missed the final in 11th. 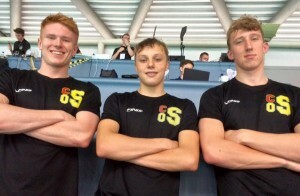 More PBs followed with Will Camden (15) reducing his 200 Fly time by 2 seconds to finish 15th; Matt George eased into tonight’s 200 fly final; Marcus Dey (15) and Nathan Lowe (16) recorded PBs in the 100 Backstroke, Nathan finishing 14th. The finals list for tonight reads – Matt George, Chelsea Crabtree, Elly Fraser and Marcus Dey. Matt started the finals session with a PB in his 200 Fly finishing 4th in 2.05.49. In the 200 Breaststroke Elly Fraser (still only 12 years old) had remarkably qualified for the 13/14 final and performed superbly with another PB of 2:42.70 finishing 9th. Chelsea Crabtree (15) made a final at her first Nationals recording 2:43.15. She has shown great character after almost missing the competition through injury that prevented her swimming Breaststroke for two weeks. Marcus Dey completed the finals with a great swim and PB of 1.00.96 in the 100 Backstroke finishing 7th. 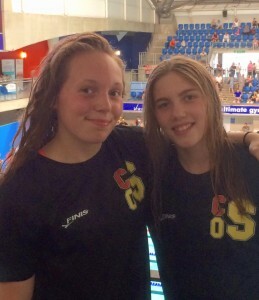 Today’s Pic is our newbie National swimmers Chelsea and Elly qualifying for finals at their first Nationals……. 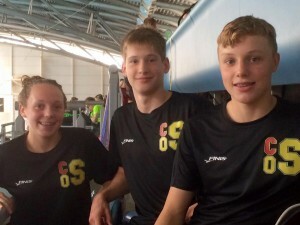 The PBs rolled in nicely today – Good Job Swimmers ….. This morning saw Emily Keays finish 13th in the 200 Fly; Matt George and Scott Provan swam on PB for their 100 Freestyles finishing 19th and 13th respectively. Emma Jones had another good performance fractionally off PB in her 50 Free. 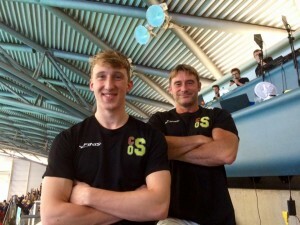 Lewis Clough and Marcus Dey ‘eased’ into tonight’s finals of 100 Free and 400 IM respectively. This afternoon Scotty P was back for the 1500 swimming just outside his PB to finish 10th in 17.00.64 His performances deserve particular applause after being sidelined with illness for 2 weeks out of the past 3. Into the finals and a mighty exciting race saw the closest of finishes where Lewis Clough took bronze in the 17/18 100 metres freezes with just 3/10ths separating 1st and 5th. He did take the lead with 25 to go and a frantic finish ensued. His time of 50.97 was a new PB and he had to compete against his other 3 GB team mates who were members of the 4×100 relay that made the final at the European Junior Championships. Pic today is Lewis with his hard earned medal. There are no hiding places at the National Championships – you have to be at your best and then some! Roll on Day 4 Team Salford. 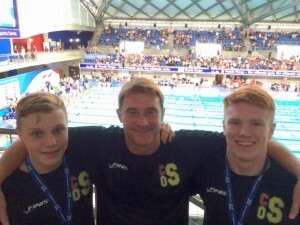 James Duncan began the morning finishing 17th in the 15 years 200 Breaststroke. 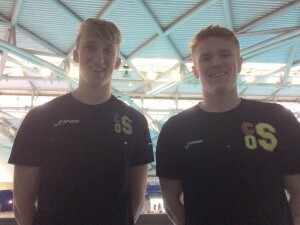 PBs then followed in the 100 Butterfly from Will Camden (1:00:66) finishing 17th and Matthew George in 58:32. Matt goes into the evening finals joined by Lewis Clough who had the unusual luxury of qualifying comfortably for the 17/18 final. 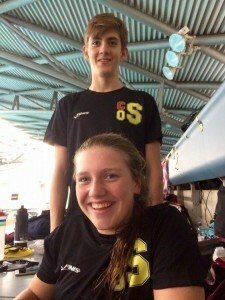 Good swims tonight brought about a new PB of 57.93 for Matthew who finished 7th. Lewis again got involved in a fingernail finish and the opposition had longer arms as it came down to the last stroke with Lewis edged out into 4th in 55:11. Quite controversially Lewis was denied a medal as the winner competed for Estonia only 2 weeks ago at the European Junior Championships. This meet is called ‘The British Summer Championships’ surely for British Swimmers? …….apparently not…..you can chose to represent another country outside Britain and then change your allegiance to being British by virtue of a membership of any ASA Club…..(floodgates opening soon for any foreign swimmer wishing to compete here and deny British born swimmers of medals)…..bit of a joke and what a shame……commemorative medals making a comeback???? Today an injustice has taken place – let’s hope someone has the honour and integrity to put this right in the future. Pics today of finalists Lewis and Matt; Laura Boardman who was only slightly obliging for my attempt at an amazing photo; and the Fantastic Four. Marcus Dey and Matthew George moved into tonight’s finals with good performances in the 200 IM. Lewis Clough set up another nail biter for later in the 50 Freestyle whilst Laura Boardman (17) finished 16th swimming out of age in the 17/18 400 Freestyle this morning. 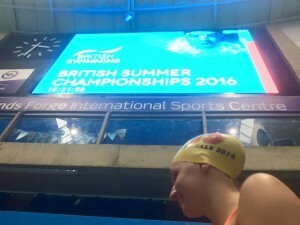 Emma Jones (15) rounded off her British Champs appearances with another PB of 31.20 in the 50 Backstroke finishing 13th. Well the lads really stood up tonight in the finals. Marcus reduced his entry time by an incredible 6 seconds to finish 5th. Matthew moved up to 7th from 10th – a season best 2.10.19 in a brave swim which saw him lead the race at one point. 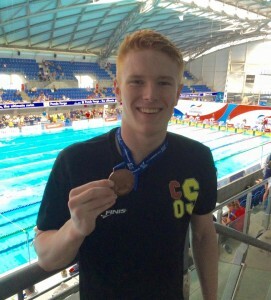 Lewis Clough came 7th in the 50 Free final and will be hunting for medals in the 200 Freestyle tomorrow. 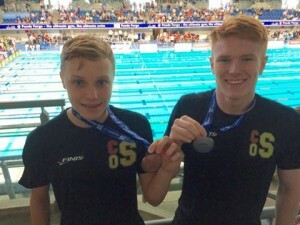 A mixed morning of swims began comfortably with Lewis Clough (18) heading into the 200 Free final in pole position, he was followed into the finals by Matt George (16) however Scott Provan (15) missed out in 13th place. In similar fashion Marcus Dey (15) lowered his PB to take a centre lane tonight in the 200 Backstroke. Sam Taylor (16) put in a brave swim but was again just outside the finals in 14th place. Will Camden (15) knocked a chunk off his PB to finish 17th. Chelsea Crabtree was another just outside the final in 12th place with a good time of 1.15.81 – a very encouraging first British Nationals performance. Also swimming at her first British Summer Nationals was Emily Keays who swam a credible 1.06.09 in the 100 Butterfly to finish 18th. recording big PBs in both with 1.55.01 (6th) and 2.07.60 (6th from 10th position). Great meet Matt. Marcus Dey produced the race of his life to win Bronze in the 200 Backstroke (his first National Medal) – always closing down the opposition in the final straight he may have snatched Gold with another 2 or 3 Metres. Big PB of 2.07.76 Great Job Marcus. Lewis took a silver medal in the 200 Freestyle. 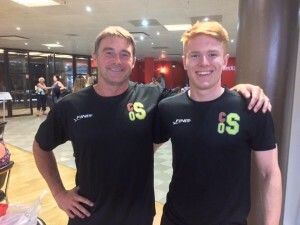 It was frustrating missing out on the gold but henow heads off to LSU in the United States for 4 years – He is a Salford GB, England & Commonwealth Youth Games representative who has been a National Champion. We wish him all the best and thank him for his service and loyalty to Salford. Great Performance Salford – Now let’s have some of the same at the English Nationals.